Hi. I am pautz, a German TES: Legends player and sometimes also streamer. I began playing TES: Legends in the last days of closed beta, but for several reasons the October season was the first one that I was able to play seriously. Today, I want to present you the deck I was playing in this very season from around rank six all the way to top twenty Legend with an insane win rate of about 75 % when entering the top 100. It is a deck from the class that is widely believed to be the strongest: Archer. I do also believe that this is the case and I will come to an explanation later on, but first I want to go through the deck list and explain some tech choices. This deck is a variant of the cycle archer deck list that is featured in the BTL Meta Snapshot 2, which has some interesting card choices. The deck gives away a little bit of its early pressure in order to have more value later in the game. Rapid Shot: can be used as cheap removal for problematic minions like Dune Smuggler or as enabler for Finish Off effects while cycling through the deck. I would always play them over Sharpshooter Scouts because of the card draw, which is in most cases more important than the 1/1 body or the one point of face damage. Daring Cutpurse: Good twp=drop for pushing early damage. Can grow to a serious threat if left unchecked. My opponents often Elixir out a Crushing Blow on 2 in order to deal with it right away. If you can follow up with Kinsman and Werebat, you practically won the game at that point. Thieves Guild Recruit: Very solid two-drop that helps cycling through your deck. It has the same stats as pre-nerf Novice Engineer in HS, but with the ability to reduce the cost of Tazkad or Giant by two. A turn five or six Tazkad can win you the game on its own. Snake Tooth Necklace: I used to run 3 Finish Offs, since its a very efficient removal, especially for Archer. More often than not, it was sitting on 3 Finish Off effects (Leaf Lurkers included), so I decided to include a Necklace instead of a Finish Off. It helped me to proc my Marshals and Jarls more consistently or to stabilize against aggressive decks (I am looking at you, Crusader), not to mention the insane synergy with House Kinsman. Triumphant Jarl: This card is staple in Archer, but not all lists are running three, especially with so much cycle one could expect that running two would be enough. Of course, it is a terrible card when you are behind, but I would never ever leave any of them out of the deck. Drawing two cards is huge, especially late game against control decks. This can be the difference between winning and losing. Belligerent Giant: A debatable card. It is very weak to Lighning Bolt, but often, you can use it to bounce a Guard back to the hand to push more damage and leave a thread on the board. Its Breakthrough makes it even more threatening. Except from Iron Atronarch, it can attack over any Guard in the game when left alive while also usually pushing damage, making it a perfect setup for Tazkad the turn after. Mournhold Traitors, since they are weak to Young Mammoth, Fighters Guild Recruit and Assassin in general. Mage Slayers, since I have basically no way of buffing it. Allena Benoch, since I have Finish Off and want to generate tempo in the mid-game. If I would either be more aggressive or more control oriented, she would be a good fit, but in this certain list, I want to generate more tempo on the turns I would consider playing it. Withered Hand Cultist, since I rely on things like Rapid Shot and Finish Off in the mid-game. Compared to other versions of Archer, this deck usually plays a bit slower. It has no insane openers like Mournhold Traitor or Nord Firebrand + Steel Scimitar. You try to remove threats from your opponent while start building your own board. House Kinsman is a very good card for this purpose, because it is (or better will have been, when the upcoming nerfs go live) often a 2-for-1 while also damaging your opponent and raising your life total. Damaging your opponent means breaking runes, but this is basically what you want to do going into the mid-game. The reason for this is that Archer can benefit a lot from the single best board clear in the game: Burn and Pillage. At first look I thought it was ok, but not great, but when you have seen it in action, you would never miss on that one. Due to the lane system, you can start spamming one lane (usually the shadow lane), than attack your opponent the turn after and destroy their whole board with Burn and Pillage that they build to contest yours. If you manage to do this, you basically won the game. This is also the main reason for the deck’s strength. Another one is the ability to create power plays with Soulrest Marshals and refilling your hand with Triumphant Jarl. It is a good feeling when you play 3 4/4s on Turn 6 and effectively lose only one card. Here, I will go through the most prominent match-ups you will have when you play this deck on ladder currently. This is one of the weaker matchups for the deck, besides Prophecy Assassin and Aggro Crusader. You should mulligan for a Murkwater Witch, since it is the most reliable way to damage a Crystal Tower Crafter, so you can Finish it Off or Rapid Shot it, when it has not grwon. It is also good against Goblin Skulk and Slaughterfish Spawning. The most important thing in this matchup: Never, really never, leave Hexmage alive or at least un-silenced. I like to keep Earthbone Spinner in the mulligan or hold on to Rapid Shot + Finish Off to deal with an early Hexmage. This card can kill you from any health total, so always have an answer for it. There are two major ways to win this matchup. The first is to clear all threats from the Assassin and let him run out of steam, stabilize with Werebat and Necklace and set up lethal, most likely over two turns. The other way is racing. If you feel like winning the race (or have Burn and Pillage to shut him out), just spam the Shadow lane, since they usually don’t run any Guards except from Fighters Guild Recruit and Murkwater Witch, with which you should be able to deal with fairly easily. Again the advice: don’t race them if they have a Hexmage. You are going to lose. I learned that the hard way when I felt pretty comfortable on 22 life. Smuggler’s Hall nightmare of four Actions crushed me. This matchup is pretty even, due to the fact that you can do pretty much nothing against an early Divine Fervor. If they do not have it by Turn four or five, you should be good to go. Pyromancer is the perfect answer to Reinforcements, Finish Offs should be kept for Hive Defenders, and make sure you have more health then them as soon as they have six Magicka available, since Golden Saint is a serious problem. If they have Divine Fervor early, you should start racing and praying that you draw Burn and Pillage and can activate it for enough damage, since they tend to spam the board and run out of cards. This is basically some advice how to play the mirror. Remember: everything you want to do your opponent also wants to do. The key in this matchup is to stay ahead on life and also not lose too much of it, since Burn and Pillage is also a thing for them. So you are looking for all cards that help you achieve this: Kinsman, Werebat, Necklace, but also Murkwater Witch and Fighters Guild Recruit. Don’t be afraid to use a silence to an opposing Kinsman and take only highly favorable trades. Lists that run Withered Hand Cultist can be problematic if they have one on three, since you can not Rapid Shot and Finish Off them. You should find a way of dealing with the Cultist pretty fast, or you may have a hard time. The nemesis of this deck. Your game plan is to break runes so that you can Burn and Pillage, theirs is to get runes broken in order to generate insane tempo with the prophecies they hit. It is not unusual that they hit all five prophecies, and then you have pretty much no chance of winning the game. If one now thinks it is good to let them run out of gas, the chance that you fall behind is pretty high, but without Burn and Pillage, a comeback is pretty unlikely. If you are facing such a deck, you should start breaking runes at turn four or five not to get completely wrecked by a Werebat or double Fate Weaver and hope that you can win the race game. Unlike most other decks, your game plan versus Aggro Crusader is to be aggressive. You should remove a Fifth Legion Trainer and at times also a Bruma Profiteer, because they can do insane things with them, but apart from that, your damage should be sent to their face. The reason is that you want to have Burn and Pillage for as much damage as possible. Aggro Crusader floods the board and wants to overrun you. They will most likely ignore your things, so if you can set up a three or four damage Burn and Pillage on six, you will have a board to go for the last bit of damage while they have to play from behind, which is not in the nature of the deck. Pyromancer is a great card in this match since it can take care of a whole lane. 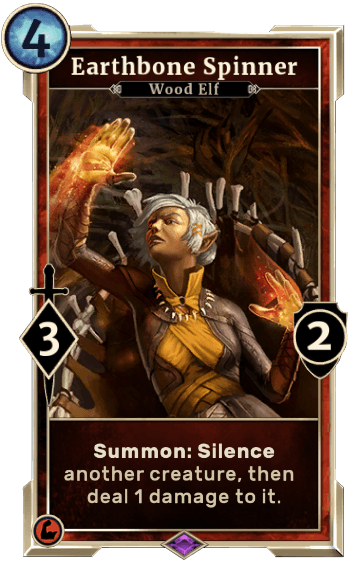 Another card that should definitely be kept is Murkwater Witch. It is a good answer to most of their early plays and helps you to prevent a Turn 2 or 3 Pit Lion. This is one of the best matchups. You should put out threat after threat after threat until they run out of removal. Control Mages usually don’t run cheap Guards, so you should be able to push enough damage by the time they usually stabilize. Try to play around Javelin and Lightning Bolt prophecies. Sometimes it is safer to hold back for one turn. Murkwater Witches should be kept for Elusive Schemers and your Finish Off to keep their board as clear as possible, because Pillaging tribune allows them to stabilize and get out of your range. Ice Storm is not that big of an issue since most of your mid-to-late game has 4+ health. The ability to beat Ramp Scout consistently is in my opinion one of the reasons why this deck is so popular at the moment. It is hard for Ramp Scout to deal with your insane mid-game. They will usually put up a bunch of Guards to protect their face. Thorn Histmage fulfills this purpose pretty well, since its five health makes it awkward to deal with. Depending on your hand, you should hold back some removal for Night Shadow and Nahagliiv. The latter is invulnerable to Rapid Shot and Finish Off, but can be targeted by Leaflurker. Keep that in mind when you have both options available for another minion. In the later game, Belligerent Giant can win you the game by sending a large guard back to hand and possibly killing it the next turn. Most Ramp Scouts don’t attack you, so you will usually have enough time to draw into lethal. They also don’t have an efficient way to deal with big boards, so often an all-in play with Soulrest Marshal is the way to go. If you face a lot of Ramp Scouts, you can include a second Blood Dragon and/or Allena instead of Pyromancer and Burn and Pillage. In my opinion, this deck is one of the strongest at the moment since it is so versatile. You can play the control part if you need to, but at the same time you are able to race even the fastest decks due to the fact that you have Burn and Pillage and can shut them down right on time. A key point playing this deck is to identify the game plan of your opponent and evaluate your hand in order to decide which way will be the most successful. Sometimes the right play is to send everything to their face and hope for a good draw, but that is how card games sometimes work, right? One short note on the upcoming card changes: I think they will hit the deck quite a bit. Positioning of your creatures will be more important, since Fire Storm is a thing. It will be harder to win against Assassin and Fifth Legion Trainer will be an even larger threat, but the deck will remain playable and in my opinion be the first choice for an anti-Control deck. If you liked this guide, you can catch me on Twitch playing this (and also other decks), and on Twitter (my private Twitter, a TES:Legends one is in preparation). Managed to hit legend this morning with this list. I was running archer already, but the one ofs with the Snake Tooth and Giant were the difference makers to go from 1 to Legend. The giant actually won my final game to legend by getting rid of a late Hist Grove and swinging for exactly lethal. Great guide, looking forward to your thoughts in the future.